View from under Feather Tor where we've stopped to eat our packed lunch....no other diners, waiters or any human company for miles. A cuckoo in the distance, plenty of surrounding birdsong for muzak and the occasional pack of passing ponies instead of shopping crowds....suits me fine. Just the powerful presence distant Vixen Tor watching us from a long way off like a huge Devonshire Sphinx. Sheer bliss, Chris is painting and me about to tuck into PLF's 'The Broken Road' ( a highly recommended read, if you haven't already). 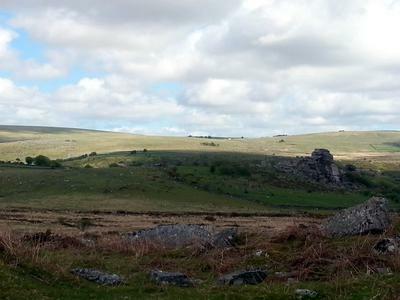 Thank you very much for your beautiful travel pictures of Dartmoor. Really appreciate this. Thanks for sharing. All the best in your future trips.